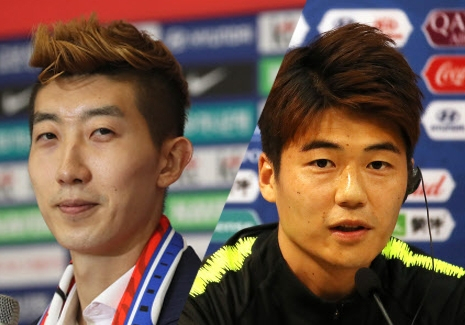 World Cup fever may have cooled down in South Korea, but national team hero Jo Hyun-woo and captain Ki Sung-yueng have come under the spotlight with their exceptional love for their family members going viral online. Jo, who shot to stardom after his impressive performance against Germany on Wednesday, is being called “Bit (“Shining” in Korean) Hyun-woo” among soccer fans here. The nickname refers to his shining personality and football skills. The 26-year-old goalkeeper tied the knot with his wife Lee Hee-young in 2016, and footage of Jo’s marriage proposal set social media on fire. During halftime of the 100th game Jo played as a goalkeeper at Daegu Football Club, a stadium announcer started to read a letter that Jo wrote. Recalling the moment when he first met her, Jo said he could “barely move” as he fell in love at first sight. After the event, Jo got down on one knee and proposed to his partner in front of spectators. Although he has since deleted his Instagram account, Jo used to plaster the photo-sharing platform with pictures of his wife and baby daughter, along with captions such as “I love you.” He even introduced himself as “Lee’s Husband” and “Harin’s Dad” on his profile, instead of highlighting his career as a football player. 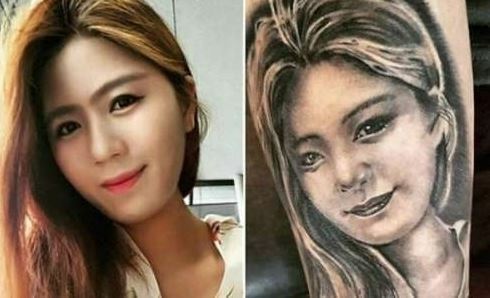 A huge tattoo of Lee’s face on Jo’s right arm also shows how much he loves his wife. Jo said he got the tattoo as it makes him feel like his wife is with him during every game he plays. After Wednesday’s game, Jo sent a thankful message to Lee during an interview. According to a story that Han revealed in an interview, Ki said “I’ll love you so much even if you are old, so don’t worry too much about getting on in years,” when Han asked Ki if he would dump her if she gets old. Instagram comments that Ki left on Han’s posts also went viral online. Whenever Han uploads pictures to her account, Ki leaves such messages as “You look too beautiful.” During one of Han’s magazine photo shoots, Ki jokingly said “Honey, let’s change our faces,” praising her elegant appearance. “Ki is actually a ‘Sa-rang-kkun,’ who becomes a cute puppy in front of Han,” a Twitter user said, posting pictures of Ki making a heart pose with his arms for his wife. The tweet was shared over 2,700 times and received more than 1,200 likes.